To be come across an item of Ming Dynasty silver is a rarity in itself; so little survives. To come across an item that is indisputably Imperial is rarer still, yet to understand that such a piece is of such overwhelming importance not only in the 2200-year history of Chinese silver-making and our understanding of it but of particular importance to the the evolution of the to the ensuing Qing Dynasty silver-making tradition is tantamount to a eureka moment! One such an item nestled somewhat inconspicuously within the sale of Fine Buddhist Works of Art, part of Christie’s 2017 Hong Kong Week spring sale event – a large, finely worked silver censer. This item and other similar items that have come recently to light demonstrate that a far more seamless transition existed from the Ming silver-making style to that of the Qing Dynasty. A virtual plethora of Buddhist allegorical decorative motifs and vignettes adorn this piece that is set off by a pair of massive dragon-head handles interrupted with a partial lingzhi cloud-form tongue towards the lower part of the loop, serve as a perfect balance to the monumentalism of the bowl; the censer is partially gilded and is bronze lined. It is not just the grandness of this censer that makes it so important, albeit that it is Ming; it is the fact it presents an extremely rare example of Ming silver that clearly demonstrates the exact same mastery and silver-working style that dominated much of Qing Dynasty silver. 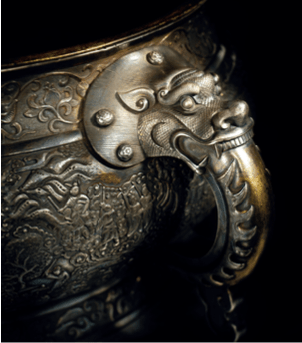 Until now, many researchers of Chinese silver, myself included, were of the opinion that the style and workmanship of Qing silver was a distinct silver genus of its own. It can now be seen that the early 17th century saw silver being made in Imperial workshops in virtually the same style and working with the same heavy gauge of silver. one generally sees in Qing silver. 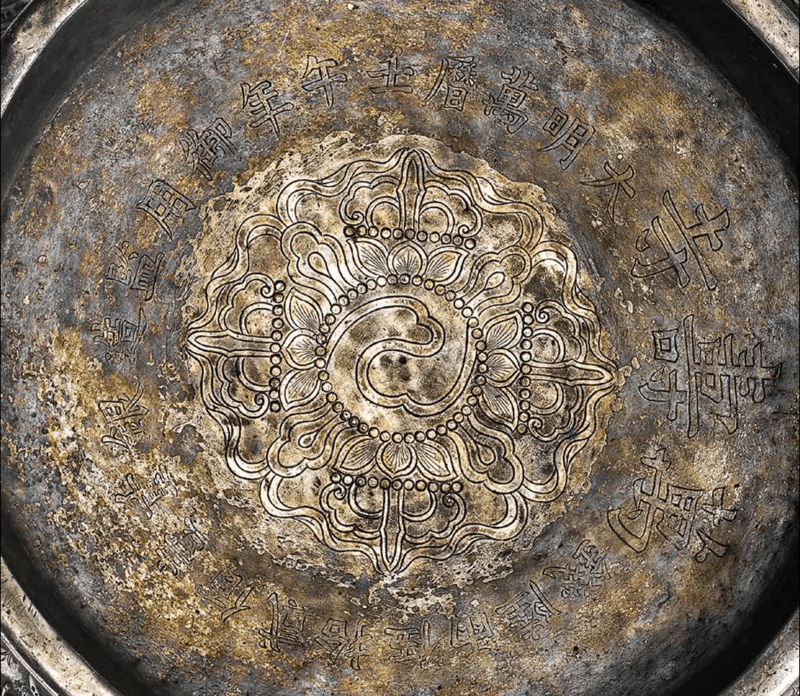 This item of silver, by default, becomes an important and vital piece of the jigsaw of the complex history of Chinese silver-making that has been missing for so long – a stylistic stepping stone linking the Ming and Qing Dynasties. This in itself immediately presents an interesting conundrum; the Ming Dynasty was unequivocally Han, yet the Qing Dynasty was Manchu. While the latter was a product of its own culture, it endeavoured to bring the Han within the Qing orbit, albeit enhanced by an enthusiastic, yet consciously orchestrated, embracing of Confucian principles. For decorative motifs on a Ming era censer to transmute virtually intact to another dynasty and culture is no mean feat. By adopting the prestige of the Han, the Qing were not in any way selling their birthright to any devil; it was in fact a masterstroke of subtle diplomacy that while giving credence to the Han, it quite categorically established a perceived superior Qing otherness. An inscription on the base reads: ‘Da Ming Wanli renwu nian yuyongjian zao yinzhong yibai ershiwu liang liu qian’ [It is] made in the cyclical renwu year by the Directorate for Palace Accoutrements. The silver measures one hundred and twenty-five liang plus six qian in total weight. The ancient Chinese weight equates to 4684.82 grams. The cyclical renwu year corresponds to the year 1582 when the Wanli Emperor reigned. Central to the inscription is a Buddhist vishvavajra; an emblem of protection and of Buddhist deities whose influence encourage immoveable determination. It represents the stability or foundation of the physical world. 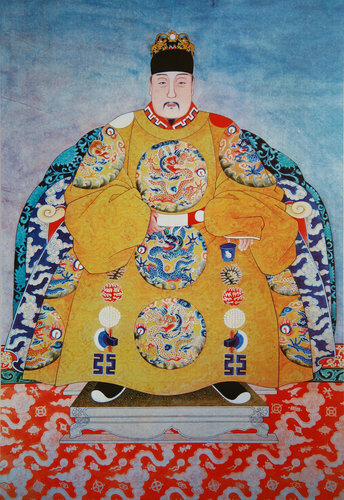 The Wanli Emperor was the longest reigning of the entire Ming Dynasty. The name of his reign fittingly means “Ten Thousand Calendars”; the reign was to last 48 years. The Ming Dynasty was the first and only Chinese dynasty interested in exploration and trade with the world. Unfortunately when Ming Emperor Yongle died in 1424, so did funding and interest in exploration, travel and large scale trade with other countries. Emperor Ming Shenzong ascended the throne at the age of nine; it can be of no surprise that he became known as the reluctant Emperor. 1571, just one year prior to his becoming Emperor saw China proclaim that all taxes were to be paid in silver which had the effect of unwittingly unleashing a whole new global phenomenon – China’s dependency on silver was to become the engine that created world trade as we know it today; the single product most responsible for the birth of world trade was silver. The amount of silver pouring into the Ming treasury was in the region of $190 billion in today’s values. The Ming Dynasty was responsible for creating over 30% of the entire world GDP peaking in the period of Wanli with an staggering estimated total silver wealth accounting for 55% of the world GDP. By 1572 Potosi had become the most populated city in the Western world – 120,000 people, exceeding the population of cities such as Paris and London. The Wanli Emperor developed, however, a particular affinity to silver, not because he admired its decorative qualities but because his reign severely drained the Imperial coffers. Twelve years after the censer was made, 1596, the Emperor began a concerted campaign to open silver mines in Henan Province, Shaanxi, Zhejiang and Shanxi Provinces in an effort to replenish the dire fiscal situation despite the fact that mining was at odds with Confucian principles. The Emperor had caved in to the demands of the powerful court eunuchs. Ray Huang’s masterful “1587, A Year of No Significance” fittingly paints Wanli as an intelligent, if weak-willed, man trapped in a bankrupt and overly bureaucratic system. It has often been said that the Chinese approach to life has similarities with Chinese opera. The same could be said of Qing Dynasty silver, given its almost perpetually complex history and that of China itself is played out in the unique hybrid decorative silver objects. The appearance of this censer clearly demonstrates that the Qing silver style and tradition had its roots firmly planted in the Emperor Wanli’s reign and in Beijing, making the censer of supreme historic cultural significance to China’s 2200-year silver-making tradition. The internationalism created by the later phenomenon of the China Trade in the ensuing Qing Dynasty would become the engine that created the incredibly complex and vast repertoire of Qing Dynasty silver that is generally acknowledged as being of Canton [Guangzhou] origin in terms of craftsmanship and expertise. Academics who have an affinity to the decorative arts are often faced with the dilemma whether an important item is made all the more remarkable if it commands a high value or whether that high price enhances its significance. The answer is probably in the affirmative to the former but despite the fact the censer succeeded in attracting a final bid in excess of US$700,000, the relevance the censer has in establishing a new understanding for the subsequent Qing Dynasty silver genus is simply beyond value.